Regularly keep an eye on any potential problems brewing in your parking lot so that you can have them addressed quickly before they get out of control and more expensive to fix. It’s an especially good idea to take a thorough survey of your parking lot in the spring, after winter’s worst is over. Check for any damage left behind by snow plows. Also check for cracks and burgeoning potholes. Any crack measuring ¼ to 1 should be repaired by crack filling. The sooner you address this damage, the longer your parking lot will last, and the less it will cost to repair. Excessive dirt, branches, weeds, trash and spills should always be cleared away promptly. These can create and widen tiny cracks, turning them into bigger cracks. It can also strip the protective layer of sealcoat off the asphalt, making it vulnerable to more damage. Have you noticed that the parking lot doesn’t drain well after a storm? Are there sunken spots or crumbling asphalt around the drains? These can pose a major safety hazard as well as quickly do a lot of damage to your parking lot, so if you see anything like this, contact Espina Paving for repairs right away. Every 2-3 years, depending on your parking lot’s traffic load, you should schedule time in the late spring, summer or early fall to have the parking lot sealcoated. If the finish or paint on the parking lot looks dull and faded, it may be time to get this done. Regular sealcoating fills small cracks to prevent them becoming bigger and provides a great deal of climate protection for your parking lot, which will help it last longer and require fewer repairs. At the end of winter, go around and look at all the curbs as well as the surface of the parking lot. Even the best snow removal crews sometimes miss the mark during heavy snowstorms. Prompt repairs to these areas will prevent more expensive ones down the line. It may not just be around the drains and manhole covers—if you notice any standing pools of water anywhere on the parking lot, there is a drainage problem that needs to be addressed. Water is not your parking lot’s friend; it can seep into small cracks and widen them, particularly during winter’s freeze-thaw cycle. Speaking of the freeze-thaw cycle and water, make sure to get help repairing any areas of the parking lot that have buckled from freezing, cracks that have started widening, and obviously, any outright potholes. With regular sealcoating, proper drainage and sweeping, you can hopefully avoid these problems, but if you can’t, call Espina Paving for assistance. Parking lot repairs will hopefully be a few-and-far-between item in the budget, but make sure to keep funds at the ready, just in case; and always budget for regular maintenance. A poorly-maintained parking lot doesn’t just look shoddy, it can become a potential safety hazard and liability problem for your property. 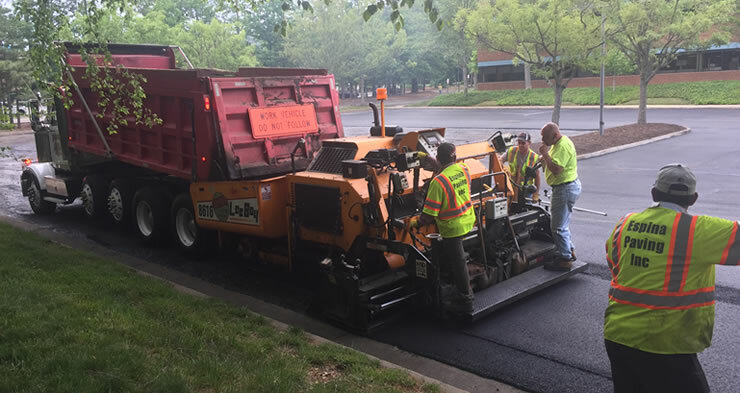 Not every paving contractor in Northern Virginia can handle large property and parking lot paving jobs, so do your homework and build a working relationship with Espina Paving. We’ve been doing commercial, municipal and industrial paving jobs for 3 decades and can help you make the most of your investment in your parking lot! Contact Espina Paving today for a free estimate: (703) 491-9100. We look forward to working with you!